Motocross/Enduro is possibly the most demanding Motorsport their is, which is why you need to have the most comfortable and practical gear to reduce injury and fatigue such as arm pump. Selecting the right handlebar grips is a huge part of keeping control of your bike with less effort, which is why we offer a large selection of grips for Off road applications, with different compounds, grip patterns and manufacturers available, choosing the right grips has never been easier! The Diamond Grip is a triple density grip that focuses on reducing arm fatigue without sacrificing control. The medium density waffle pattern delivers maximum comfort and durability while the soft density diamond pattern area reduces vibration, arm pump and fatigue, and the firm density for a more durable end cap. 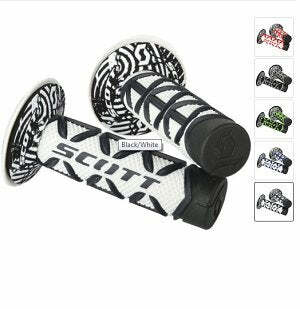 Included Neoprene grip donuts help reduce abrasion and thumb blisters. Full diamond / half-waffle design. 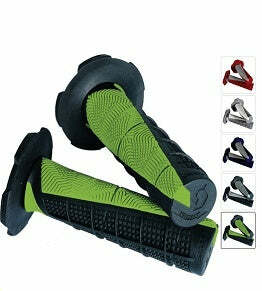 Firm density end cap is tear-resistant, prolonging grip life. Medium density diamond pattern delivers maximum comfort and durability. Soft density waffle pattern reduces vibration, arm pump and fatigue.